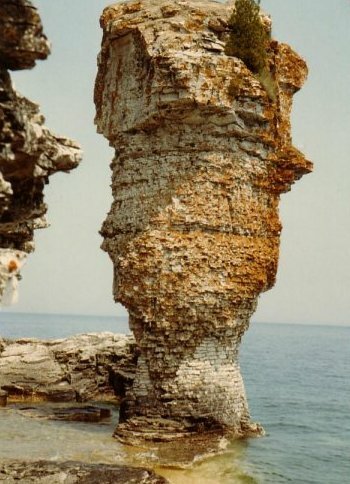 Georgian Bay has an area of several hundred square miles and includes tens of thousands of small uninhabited islands. It is a sailors, and sea-kayakers, dream. The most popular area for cruising is called the North Channel which is the area from Killarney going west and running north of Manatoulin Island. There are many islands and coves to anchor off in this area and you can spend weeks to discover it all. Killarney, Baie Finn, and Covered Portage Cove (shown to the right) are must places to visit. The Bustard Islands are another favourite area of mine. You can cruise up the east coast of Lake Huron by going through the 30,000 islands known as the "Inside Passage", or you can sail directly north in the Lake itself. I had an amusing incident when I sailed directly from Midland (in southern Georgian Bay) to Killarney in a very strong south-westerly wind - doing an overnight passage as, for my boat it was an 18 hour trip, and when I arrived into Killarney - protected by surrounding islands - a guy in a fishing boat called out to me and said "Don't go out into the Lake - you won't survive a minute!" The North Channel can be busy with charter and cruising boats in July and August but otherwise it is very quiet. I found I was alone most of the time in late June and usually had anchorages to myself. There are some amazing rock formations on the islands north of Manatoulin. Another favourite area of Georgian Bay is the quaint town of Tobermory and islands north of it such as Flowerpot shown to the right. There are docks on Flowerpot Island you can stay on for the day and the island has a really beautiful hiking path right around the island with some breathtaking view. There are a number of Marinas to stay at in Tobermory. There is always lots going on there as the Fathom Five Provincial Park for scuba diving is centered here and there are tons of young people about. There are shipwrecks to visit in the crystal clear waters too.